DC Current: "600.0 A/2000 A, Basic accuracy: ±1.3% rdg. ±0.3 A (600 A range)"
AC Current: "600.0 A/2000 A (10 Hz to 1 kHz, True RMS), Basic accuracy: ±1.3% rdg. 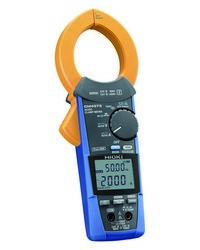 ±0.3 A (at 600 A)"
Crest factor: "600.0 A range: 3 or less, 2000 A range: 2.84 or less"
DC+AC Current: "600.0 A/2000 A (10 Hz to 1 kHz, True RMS), Basic accuracy: ±1.3% rdg. ±1.3 A (at 600 A)"
DC Voltage: "600.0 mV to 1500 V, 5 ranges, Basic accuracy: ±0.5% rdg. ±3 dgt." AC Voltage: "6.000 V to 1000 V, 4 ranges (15 Hz to 1 kHz, True RMS), Basic accuracy: ±0.9% rdg. ±3 dgt." DC +AC Voltage: "6.000 V to 1000 V, 4 ranges, Basic accuracy: ±1.0% rdg. ±7 dgt." Resistance: "600.0 ? to 600.0 k?, 4 ranges, Basic accuracy: ±0.7% rdg. ±5 dgt." Electrostatic capacity: "1.000 ?F to 1000 ?F, 4 ranges, Basic accuracy: ±1.9% rdg. ±5 dgt." Frequency: "9.999 Hz to 999.9 Hz, Basic accuracy: ±0.1% rdg. ±1 dgt." Temperature(K): "-40.0 to 400.0 ?C, add temperature probe accuracy to basic accuracy of ±0.5% rdg. ±3.0 ?C"
Voltage detection: "Hi: 40 V to 600 V AC, Lo: 80 V to 600 V AC, 50/60 Hz"
Other functions: "Automatic AC/DC detection, Plus/Minus judgement function of DC A, DC V, Max/Min/Average/PEAK MAX/ PEAK MIN value display, Filter function, Display value hold, Auto hold, Back light, Auto-power save, Buzzer sounds, Zero-adjustment"
"Dustproof, waterproof": "Grip: IP54 (when measuring an insulated conductor only), Jaw (the current sensor portion of the instrument)/ barrier: IP50 *Risk of electric shock from the conductor being measured increases when wet." Power supply: "LR03 Alkaline battery ×2, Continuous use 45 hr (Backlight OFF)"
Core jaw diameter: "92 mm (3.62 in) W×18 mm (0.71 in) D, ?55 mm (2.17 in)"
Dimensions and mass: "65 mm (2.56 in) W×250 mm (9.84 in) H×35 mm (1.38 in) D mm, 530 g (18.7 oz)"
Accessories: "TEST LEAD L9207-10, CARRYING CASE C0203, LR03 Alkaline battery ×2, Instruction Manual×1"